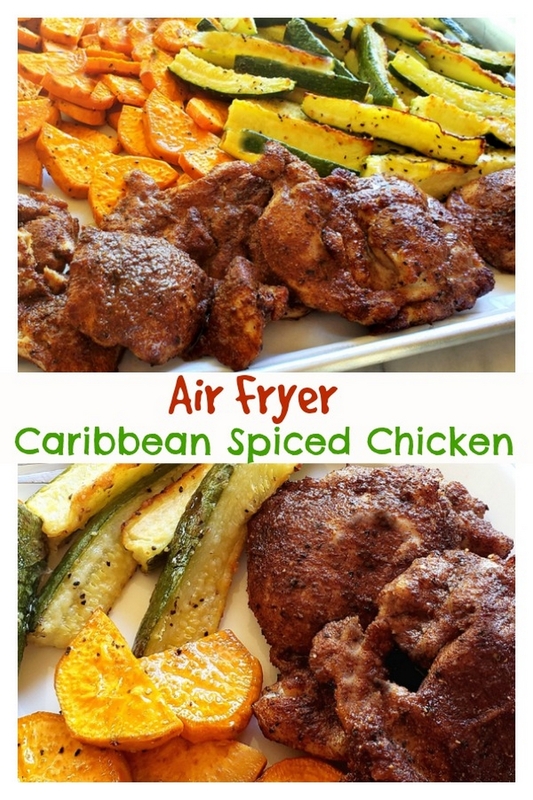 Every bite of this Air Fryer Caribbean Spiced Chicken is juicy, luscious and a testimony to the fragrant spices, flair and exotic flavors of the Caribbean. As usual, the air fryer locks in the juiciness and creates the perfect chicken every time. 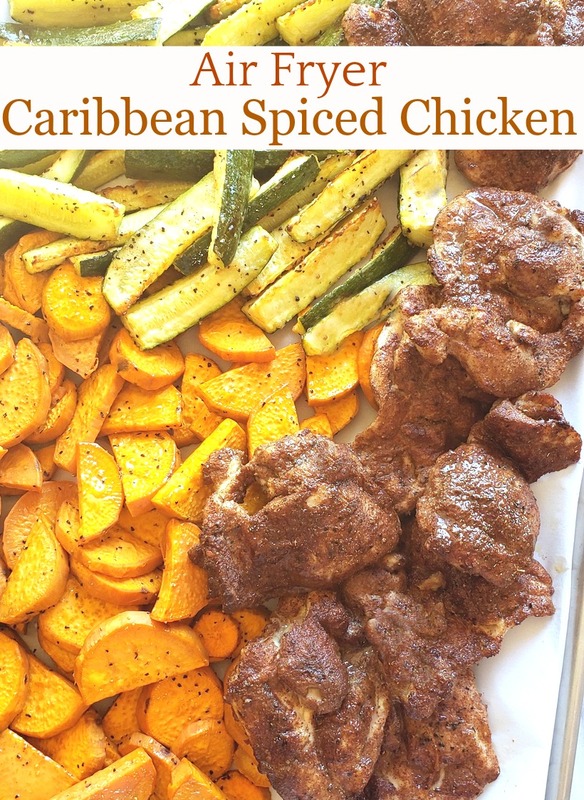 When I think of eating chicken in the Caribbean, my mind automatically shifts to that one memorable time I experienced Jerk chicken in Jamaica. Holy cow it was so spicy! I literally thought my mouth was on fire. As it turns out, Jerk seasoning relies on two principal ingredients, allspice and Scotch bonnet peppers. Other ingredients in Jerk seasoning may include cloves, cinnamon, scallions, nutmeg, thyme, garlic, brown sugar, ginger, and salt. I have been very reluctant to indulge in Jerk chicken again. I feel like whoever was cooking that day was off on their ratios of heat to other spices. The Scotch bonnet peppers drowned out all the other wonderful Caribbean spices. That is just so wrong. With this Air Fryer Caribbean Spiced Chicken I carefully took into account the heat factor, making sure not to cancel out the flavors of the cinnamon, nutmeg and ginger. And then I made the chicken in the air fryer, which is seriously the best and most useful appliance on the planet. It locks in the juiciness and your chicken is cooked to perfection. I definitely could not live without my air fryer at this point. I make so many things in it. If you have not tried my Perfect Air Fryer Salmon or my Crispy Air Fryer Parmesan Chickpeas, I highly suggest giving them a whirl. Both are delicious. The spice mix consists of ingredients you likely already have in your kitchen and the recipe is simple enough to throw together in minutes. 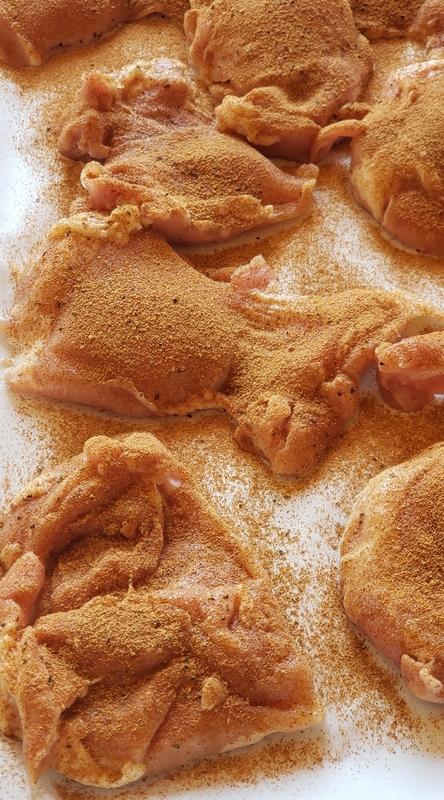 You’ll want to cover both sides of your chicken thighs with the spice mixture and brush each piece with coconut oil. 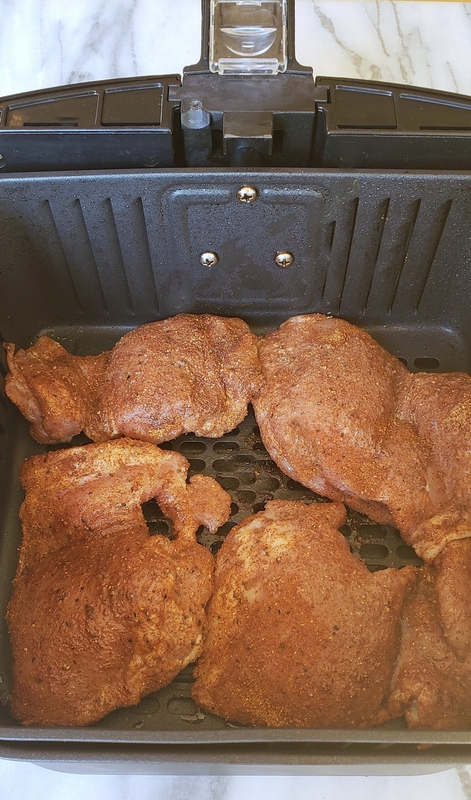 I was able to place four chicken thighs into my air fryer basket at once. It’s okay if they are touching, but do keep them from overlapping. You will have to make the chicken in several batches. As expected, the chicken comes out perfectly browned and beautiful. I highly suggest serving this dish with something like sweet potatoes since it is very savory. If you have not delved into the air frying craze, I can only say it’s worth the purchase. Mine has not left my counter since getting it last year. And if you’re cooking for one or two, it would make things so easy for you. For lunch anyone can easily throw in a piece of seasoned chicken or fish and yes, even steak and the perfect meal in ten minutes. How beautiful is this meal? If you make this, let me know how it turns out. Check out these other air fryer recipes and put your machine to work! These Air Fryer Spicy Sweet Potato Fries would be the perfect side dish with this chicken and so would this Air Fryer Roasted Corn. I have to admit these Killer Garlic Fries, which you can make in the air fryer or the oven sound insanely delicious. And who would not like to try Air Fryer Mongolian Beef? It sounds amazing. Do you have a picky eater? Three years ago we wrote 6 Happy and Helpful Picky Eating Solutions that might work for your family. Four years ago I shared with you these Cheese-Filled Grilled Avocados that are the perfect appetizer for a gathering and work great for tailgating too. 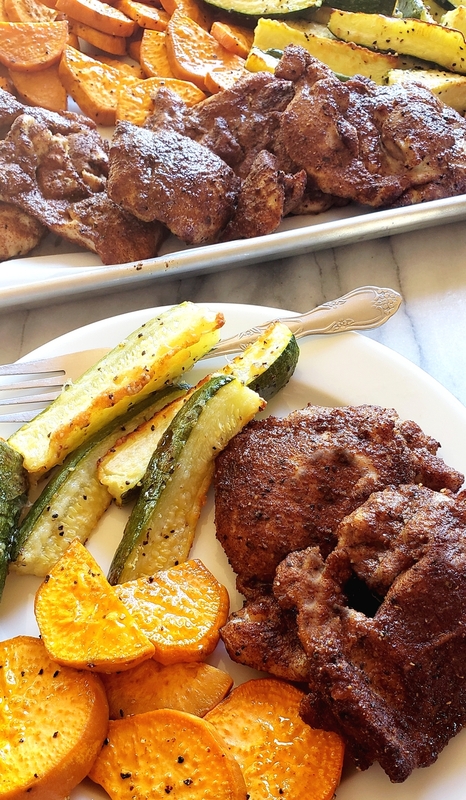 Have you joined our Noble Pig cooking community yet? It’s time you do. Remove chicken from packaging and pat dry. Place on a large baking sheet covered with paper towels to soak up any residual liquid. Salt and pepper both sides of the chicken. Let chicken sit for 30 minutes so it is not so cold when going into the air fryer. In a small bowl combine coriander, cinnamon, cayenne, ginger and nutmeg. Coat each piece of chicken with spice mixture and brush both sides with coconut oil. Place four pieces of chicken into your air fryer basket (they should not overlap, but it's okay if they are touching). Air fry at 390 degrees F for 10 minutes. Remove chicken from basket and place chicken in an oven safe dish, covering tightly with foil. Keep warm in the oven until all chicken is done. Repeat air frying instructions with the rest of the chicken. 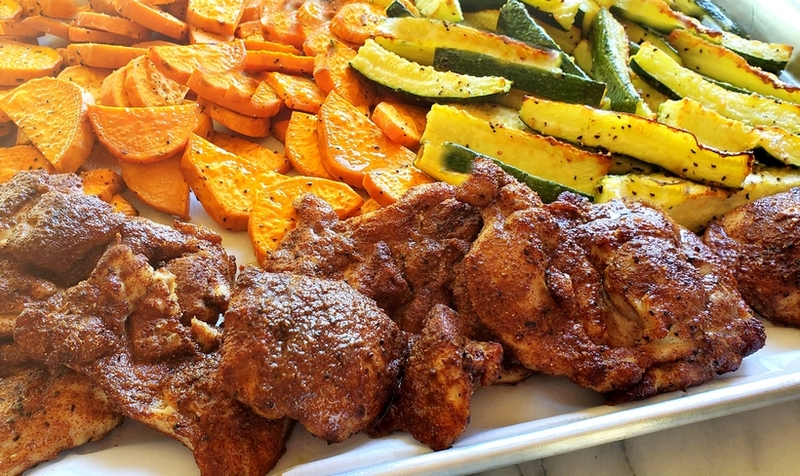 Make sure your chicken thighs are 3-4 oz each in size, otherwise you will want to slice them in half. Chicken thighs stay absolutely juicy and delicious in the air fryer. If you decide to use chicken breasts for this recipe, make sure you are using thin-sliced fillets, otherwise it will take too long for them to cook. I have found chicken breasts made in the air fryer tend to be a little dry. Beginning temperature of the chicken will make a difference in cooking time. Make sure juices are running clear before transferring chicken out of the air fryer. If the chicken needs a couple more minutes, just continue to air fry until done. This chicken reheats nicely as leftovers. There is a link in the post to my air fryer, which I love. This HAS to be packed with so much flavor! What marvelous flavors! And thanks for toning down the spices so my husband won’t complain—perfect spice ratio. Made this last night right after you posted it. It was amazing…so much with the right amount of spice. Thank you! 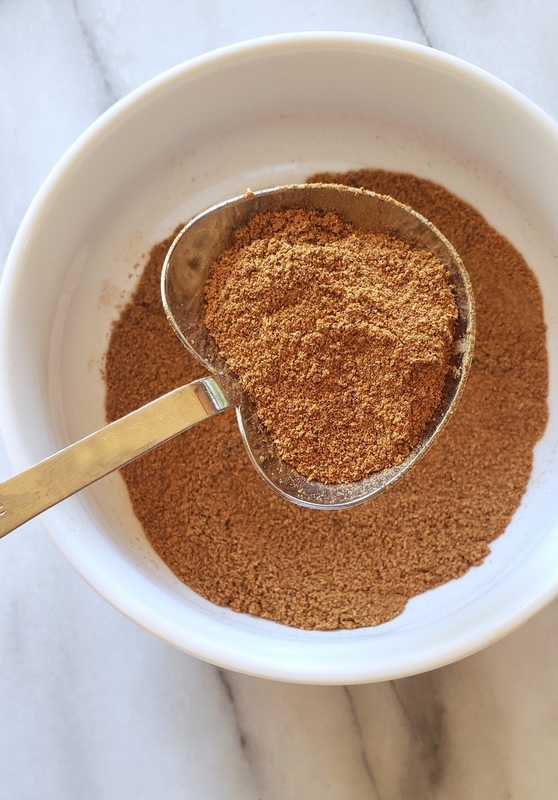 This spice mix is so flavorful despite it not requiring the entire cabinet’s worth of spices. Love it! The spice mixture sounds so tasty! Trying this in my air fryer next. I have got to upgrade my chicken in the air fryer, this looks great! When I get my air fryer, this recipe is first on the list to try!! Do you have to use boneless skinless thighs? 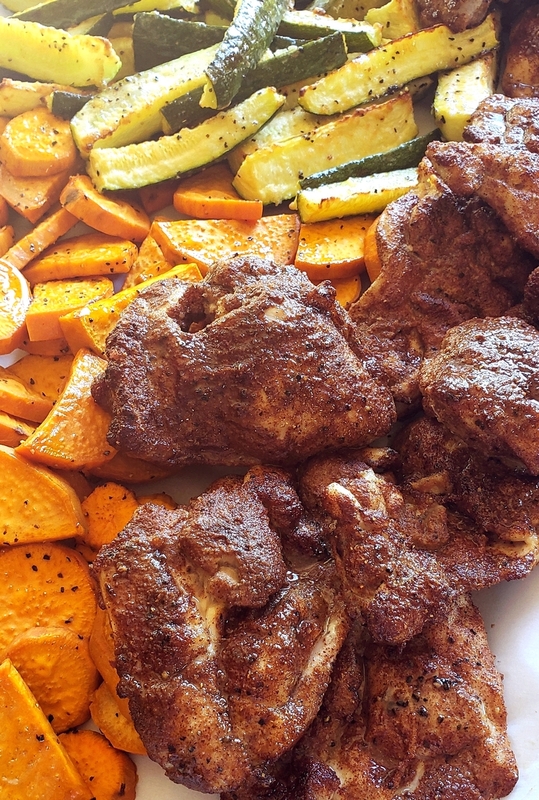 You don’t have to, but thighs are what stay juicy and have more flavor. If you us breasts, cut them really thin since a longer cooking period will dry them out. Hi there! Not hot enough! Yeah that sounds crazy hot. Is it too spicy for kids?